From WarDesign site: Imagine being briefed to create striking packaging for a product named after the height of the bottle it's packaged in. With only smallp rint runs required, there was a really opportunity to have some fun. 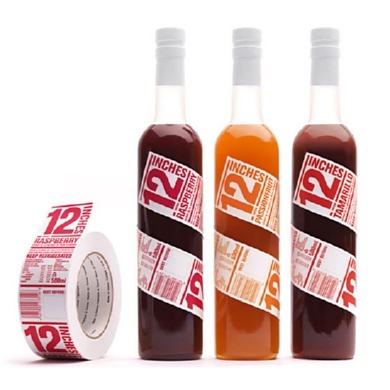 The solution was to design labels that were also 12" long, printed onto packaging tape using different colours to identify different variants. The labels wrap around the bottle creating a powerful and memorable branding device. Awards: distinction at 2008 AGDA awards.